The results of the surveys for Xylella fastidiosa conducted in the demarcated area in Alicante province have been updated on December 2017, with 20 new almond orchards declared positive. For the first time, spittlebugs Philaenus spumarius individuals have been found positive to the pathogen. With more than 9.000 plant samples examined so far in the province, 106 almond orchards positive to X. fastidiosa have been detected. 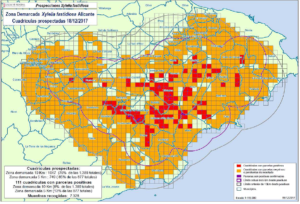 On 22th December 2017, the Regional Government of Comunitat Valenciana updated the results of the surveys being conducted in the demarcated area for Xylella fastidiosa in Alicante province, mainland Spain. The pathogen has been detected in another 20 almond orchards located in the municipalities of Altea, Benissa, Callosa d’En Sarrià, Gata de Gorgos, Llíber, Parcent i Xaló. For the first time, Philaenus spumarius individuals collected in the demarcated area were positive for X. fastidiosa, as detected by the Bacteriology laboratory at Instituto Valenciano de Investigaciones Agrarias (IVIA) and Instituto de Agricultura Sostenible (IAS-CSIC). A total of 11.622 plant samples were collected in the Comunitat Valenciana region as a whole, 2.879 of them from nurseries, 7.532 from regular crops, 854 from natural areas, and 357 from gardens. By provinces, 482 plant samples were collected in Castellón, 2.127 in Valencia and 9.013 in Alicante. To date, 8.126 plant samples from the demarcated area in Alicante province have been taken. Results (until December 22th) yielded a total of 106 almond orchards positive for X. fastidiosa in the analysed samples. Only the ST6 of the subsp. multiplex has been detected up to now. In the demarcated area in Alicante, 143 orchards with a total of 45 hectares were sprayed with authorized insecticides. Furthermore, 26 almond orchards and 975 trees have been already destroyed. The new Commission Implementing Decision (EU) 2017/2352 has just been adopted by the Regional Government of Comunitat Valenciana. This new EU regulation reduces the demarcated area from 10 to 5 km radius. In addition to the EU legislation on X. fastidiosa, the Regional Government of Comunitat Valenciana has also implemented the Spanish national plant heath regulation (Ley 43/2002), to destroy all the abandoned and neglected orchards in the demarcated area. These measures all together represent a huge effort for the Regional authorities, with a considerable investment in personnel and resources, to eradicate the pathogen in the demarcated area and avoid its spread to other regions in Spain. Subsidies for the affected growers as well as the program to restore the area are also under the responsibility of the Regional Government of Comunitat Valenciana.